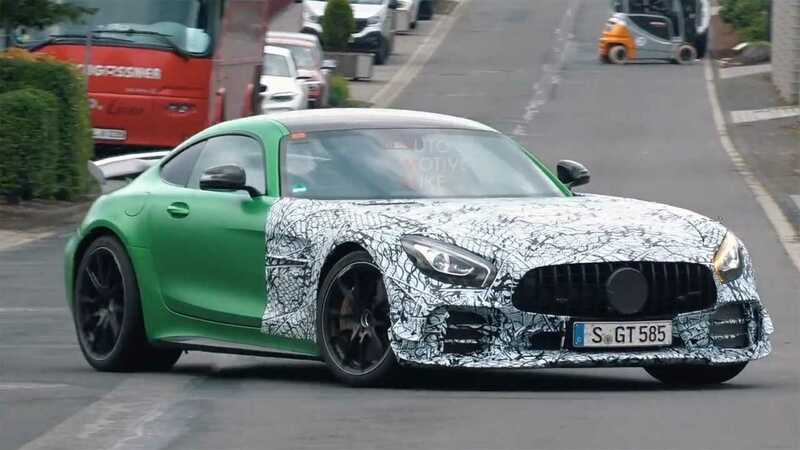 A new spy video reveals Mercedes' latest development on the Clubsport Package for the AMG GT, and it looks properly aggressive. The machine fills the needs of wealthy buyers who intend to take their supercar to the track on the weekends and want an even more capable coupe. Or just folks who want to make it look like their Mercedes sees a circuit occasionally. There are actually several AMG GT variants on display in this clip, and they're identifiable by the different front fascia designs. Some feature dual strakes in the corner intakes. Another car has a more complex design, including a single, sharp-edged element occupying each of these inlets. A third alternative features bolder styling that connects to a big canard on the side of the fascia. At least one of them also has vents along the front fenders. Mercedes is preparing a styling refresh for the GT, and these different front-end designs might denote the various trim levels. Another slim possibility is that the engineers are evaluating which layout is ideal around the Nürburgring, not only for producing the best aerodynamics but also optimizing powertrain cooling. The Clubsport Package will reportedly go on a diet compared to the existing GT R, and this will possibly involve making the coupe's cabin less luxurious. Power from the 4.0-liter twin-turbo V8 will likely inch closer to the 600 horsepower mark. "It’s lightened a little bit but it’s more of a track day version, for fun on circuits," Mercedes-AMG's Tobias Moers said describing the upcoming model in an interview from the spring. Look for the Clubsport Package to go on sale in 2019. The even more powerful Black Series will arrive about a year later.